A doctor believes that Vice President Leni Robredo is unfit for being the Vice President of the Philippines and she explained it to an open letter that she wrote on her Facebook page. Doctor and Pro-Duterte Blogger Ethel Pineda, writes an open letter for VP Leni Robredo. Pineda expressed her disappointment on the connection of the Vice President to the people who allegedly involved in the death of her husband former DILG Secretary Jesse Robredo. The blogger wrote how Robredo allies forcefully entered their condominium in Quezon City to gather the documents of her husband. “Sana hindi mo tinanggap ang pag-aya sa iyo ng Liberal Party upang maging panakip butas sa posisyon na inayawan ni Grace Poe. Kung ikaw ay taong may prinsipyo at pag-iisip, hindi ka kakampi sa mga taong may bahid ng hinala sa mga pangyayari, pagkatapos na pagkatapos ng pagkamatay ng iyong asawang si Jesse. Natatandaan mo pa? Ang mga tao ni Noynoy Aquino ay sapilitang pumasok sa inyong condominium upang kumuha ng mga dokumento ni Jesse. Nanaig ang ambisyon. O delusyon?” Pineda said. 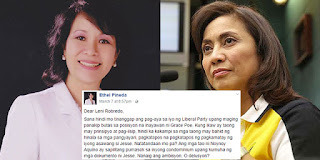 Pineda criticized the admiration of the Vice President to Lilia Pineda who allegedly closely connected to a jueteng lord and claimed that she already knew why Robredo admired the Pampanga Governor. “Nang ikaw ay nangangampanya, sinabi mo na “Kahanga-hanga si Lilia Pineda.”, gobernadora ng Pampanga na asawa ng isa sa pinakamalaking jueteng lords sa bansa. Nalaglag ang baba ko, pakipulot sa sahig. Ngayon ay hindi na ako masyadong nagtataka. May pinanggagalingan siguro ang paghanga mo. Dahil sa mga balitang lumalabas ngayon, marahil di kayo masyadong nagkakaiba.”Iyo ang Pampanga, akin ang Naga.” She added. She also reminded the Vice President on the recount filed by Bongbong Marcos against her camp. “Hintayin natin ang bilangan ulit. Ang sabi ng mga matematiko, may statistical improbability. Bukod diyan, may nabuking sa mga PCOS machines. No one can trample upon our sacred right to vote. Diyan lamang nagkaka-pantay pantay ang mga Pilipino. Ang isang boto ng senyora sa Forbes Park ay katumbas ng isang boto ng kanyang muchacha. Wag mo kaming dayain. We take that personally” Pineda said. Pineda called Robredo unfit to become the Vice President or even a cabinet member of the Duterte administration and called her lier and useless because she believes that the VP failed her responsibilities as the housing czar. “Sana pa rin, nang ikaw ay sinwerteng naluklok bilang bise presidente, nanahimik ka na sa inyong chamba. Malay mo, maging presidente ka rin. Kaya nga lang, mahirap kumalas sa sindikato, ano? Your principals are waiting for you to deliver. The power back to the LP, nothing less. You had to undermine every chance you get. The president was magnanimous enough to include you in his cabinet, though it was not really necessary, and not a matter of right for you. Not only did you choose to tangle with the president head on, you sincerely failed the responsibility entrusted to you as housing secretary. Wala ka na nga nagawa, combative ka pa.” Pineda said. She also reminded the Vice President about the controversy that they faced during the earthquake in Surigao when they allegedly tried to grab the credit from a soft drinks company that delivered drinkable water to the victims. In the final part of her open letter, Pineda reminded Robredo that she can’t “fill the shoes of Rodrigo Duterte” even she try to include the feet of her political allies. The letter of Dr. Pineda went viral on social media and already reached thousands of shares.